There are only a few touchstone events in the life of a community. Most people in Western New York can tell probably tell you where they were when the Bills lost their first Super Bowl. But absolutely everyone in the region has at least one story about living through the Blizzard of '77. Viewers will be awestruck as they travel back in time to experience the only blizzard in history that was declared a major disaster. 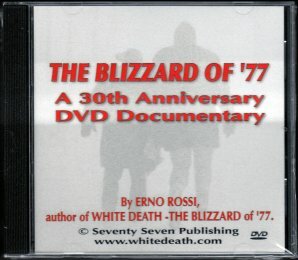 Local historian Erno Rossi has blended authentic television and radio clips with historic photographs from the infamous Blizzard of '77 in a DVD that includes more than an hour of material.